Part of a delta-like fan in Jezero crater on Mars. The crater is one of the potential landing sites of the Mars 2020 rover mission. Click the image for the full picture or here for details. Image credit: NASA/MSSS. NASA's Mars 2020 rover mission is set for a launch date in July/August 2020 and will land on Mars in February 2021. Following that, the duration of the mission is at least one Mars year, which is approximately 687 Earth days. The rover has essentially the same basic design as the Curiosity rover from the Mars Science Laboratory (MSL) mission, but whereas Curiosity has searched only for signs of habitable conditions, the 2020 mission will also seek signs of past microbial life itself. In addition to searching for signs of life it will conduct experiments and investigations in preparation of future human exploration of the planet. 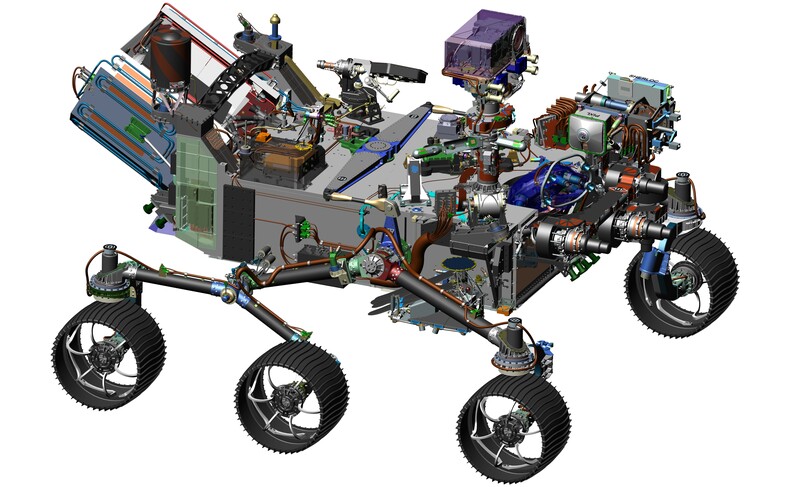 Computer-design drawing (from July 2016) for NASA's Mars 2020 rover. Click here for highest resolution. Image credit: NASA/JPL-Caltech. Assess the potential for preservation of biosignatures (signs of past life) within the selected geological environment, and search for those signs. Collect core rock and soil samples with potential evidence of past life and store the most promising of them in sealed containers, sample caches, which can be collected and returned to Earth by a future mission. The samples will also be representative of the geological diversity of the local environments at the chosen landing site. Contribute to the preparation for human exploration of Mars by testing the catalytic extraction of oxygen from the Martian atmosphere with the MOXIE instrument, and by characterizing the size and morphology of the atmospheric dust particles in order to understand their effects on surface systems and human health. The Niels Bohr Institute Mars group contributes expertise and in some cases deep space flight hardware to three of the seven science instruments on the 2020 rover: the oxygen production experiment MOXIE, the advanced camera Mastcam-Z, and SuperCam - a combined camera, laser and LIBS*, IR, and RAMAN-spectrometer. We will deliver a complete radiometric calibration target for Mastcam-Z, as well as essential parts for the calibration target for the SuperCam instrument. The parts for Mastcam-Z and SuperCam are currently under development. On the MOXIE experiment we work on characterization of Martian airborne dust, which may potentially cause problems for the equipment producing the oxygen. Mastcam-Z radiometric calibration target seen from three different angles. Top: Side view. Bottom: Seen from above. The size of the target is 10x10x7 cm. Image credit: NBI-University of Copenhagen. Mastcam-Z will be a further development of the scientific stereo cameras flown on NASA's Curiosity mission - for the 2020 mission these cameras will be equipped with zoom-lenses. In 2013 Kjartan Kinch and Morten Bo Madsen from the Mars group were invited by the instrument Principal Investigator, Professor Jim Bell, Arizona State University, to participate in the Science Team behind the proposal and development of these new cameras. The Mars group has designed the radiometric calibration target for the Mastcam-Z instrument. The target provides surfaces of different colours and grey tones, whose reflectance properties are well-known from laboratory tests and therefore will be used to calibrate the images taken by the instrument. Specially designed magnets - called sweep magnets - are mounted underneath the coloured and grey toned circular colour chips along the edge of the calibration target. These are designed so as to keep these areas as clean as possible from falling airborne dust. Previous results from the Mars Exploration Rovers and the Phoenix Mars Lander mission have shown that such magnets can keep the surface directly above them almost completely clean of the Martian airbourne dust. This effect is caused by the presence of magnetic minerals in almost all of the dust particles. Schematic of the MOXIE oxygen production experiment. Image credit: NASA. The MOXIE experiment will test - in the natural Martian environment - the production of oxygen directly from the Martian atmosphere (MOXIE is short for Mars OXygen In situ resource utilization Experiment). Such production capabilities are important for future human exploration of Mars, since the oxygen can be used for breathing, as well as for a necessary oxidant for the fuel used during the return journey to Earth. The Principal Investigator of the experiment is Mike Hecht, assistant director of research management at the MIT Haystack Observatory, Massachusetts Institute of Technology. In 2013 he invited Morten Bo Madsen from the NBI Mars group on the MOXIE Science Team to participate in the proposal and development of this experiment and to work on characterization of Martian airborne dust. Artist's rendering of the SuperCam instrument at work on a rover on Mars. Image credit: NASA. SuperCam is a combined colour camera (remote microscopic imager), laser and LIBS*-, IR-, and RAMAN-spectrometer, which will provide information on the mineralogy and the atomic and molecular composition of targets down to sub mm-size in the Martian rocks and soil. From distances of several meters it can acquire a number of different types of spectra as well as high-resolution images. Morten Bo Madsen from the Mars group is part of the SuperCam Science Team, where he participates in the design process of essential parts of SuperCam's calibration target, which is needed to calibrate its measurements against targets with known properties. A commercial foundation that supports basic scientific research within the natural sciences, social sciences and humanities conducted by Danish researchers and international researchers connected to Danish research environments. The Mars group is critically dependent on external funding to be able to participate in ongoing and upcoming missions to Mars. Means for our continued work on the Mars 2020 mission are needed, among other things, for production of the instruments we deliver for the mission, for salaries for critical personnel within our group and - once the mission has landed on Mars - for supporting surface operations, analysing and interpreting new data, and publication of results in peer-reviewed scientific journals. See Funding for more details. The Mars group's participation in NASA's Mars 2020 mission is currently funded by the Carlsberg Foundation (grant CF16-0981). For details on the foundation, see this section.